The great historic barrier of the Caucasus Mountains rises up across the wide isthmus separating the Black and Caspian seas in the region where Europe and Asia converge. Trending generally from northwest to southeast, the mountains consist of two ranges--the Greater Caucasus (Russian: Bolshoy Kavkaz) in the north and the Lesser Caucasus (Maly Kavkaz) in the south. Mount Elbrus in the Greater Caucasus range, at 18,510 feet (5,642 metres), is the highest peak. The watershed of the Greater Caucasus, the backbone of the system, traditionally has been part of the line dividing Europe and Asia. The territory is located in the southernmost European part of the Russian Federation. It covers mountain ranges of the western part of the Greater Caucasus mountain range. The site lies on territories of Krasnodar Kray, and the Republics of Adygea and Karachaevo-Cherkessia. The territory stretches for 130 km from east to west, and for 50 km from north to south. The core area of the territory is formed by the Kavkazskiy (Caucasus) Nature Reserve and its buffer zone (they both form Caucasus State Biosphere Reserve), parts of Sochi National Park and its buffer zone, territories of natural monuments. Parts of the territory are very isolated and can only be easily reached helicopter. The nearest city to the site is Sochi - 20 km. 45,5°-43,5°N, 39,8°-41,0°E. The largest part of the territory is contained within the Kavkazkiy Nature Reserve. Previously, from 1882, a major part of the territory of this nature reserve was a part of the hunting grounds of the grand Prince called 'Kuban Chase'. Since 1906 its territory was returned to local settlers, loosing its protective status. From 1909 the Russian Academy of Sciences began to raise the issue of re-establishing protected status to this territory again and in 1924 the Kavkazkiy Nature Reserve Range was established. In 1979 the Kavkazkiy Nature Reserve was awarded a status of International Biosphere Reserve under the UNESCO Man and Biosphere Programme. The Sochi National Park was established in 1983 to preserve the natural areas found on the Caucasian Black Sea Coast and for recreational, educational and scientific purposes. In 1997 the territory of this national park was divided into 5 zones of protective land use management. Three parts of the Sochi National Park, adjacent to the Kavkazkiy Nature Reserve, are included into the territory of the territory, they represent especially protected zones of the national park. The Bolshoy Thach Nature Park was established under Decree of the President of the Republic of Adygea to protect a complex of primary mountain broad-leaved formations, fur and beech-fur forests. Park's territory is wintering area for many ungulates. The Ridge Buijnij Nature Monument was established in 1996 under decision of the Cabinet of Ministers of the Republic of Adygea to protect virgin fir woods with trees of 300 years old. The River Tsitsa headwaters, and Headwaters of Rivers Pshecha and Pshechashcha Nature Monuments were established in 1997 under Decree of the President of the Republic of Adygea. They were established to protect vast beech and beech-fiir forests that are the biggest in the region. Till 1951 the Nature Park and natural monuments belonged to the Kavkazkiy Nature Reserve but later they had lost their protective status being transferred to forestry departments. Due to difficulties with access and high degree of slopes these areas were not involved in any economic activity. (Zapovedniki, 1990; MEP, 1996; Nomination form, 1998;). Inscribed as a World Heritage site in 1999. The Kavkazkiy Nature Reserve and Sochi National Park fall under federal jurisdiction. The buffer zone of the Kavkazkiy Nature Reserve and remaining protected areas fall under the republic jurisdiction of the Forests Committee of the Republic of Adygea. ALTITUDE From 250 m to3,360m above sea level (Akaragvarta Mountain). The Caucasus mountains are one of the major mountain ranges in Europe, and stand in considerable isolation from any other high ground. The nominated area is located at the western end of this mountain range, close to the Black Sea. While it does not encompass the highest or steepest parts of the Caucasus, however it includes a diverse geology, including sedimentary, metamorphic and igneous rocks from Precambrian to the Paleozoic. The northern part of the site is dominated by limestone massifs, with many caves, among them the longest and deepest cave in Russia, which has 1,600 m depth and 15 km length. Over most of the site the geomorphology has been formed by glaciation. There are high peaks, wide valleys, moraines, mountain bogs, and lakes. The site also contains about 60 remnant glaciers, with total area of 18 sq. km. More than 130 mountain lakes are located at high altitudes, among them: lakes Kardyvach, Inpsi and Bezmolviya. Glaciers feed numerous watercourses: two large rivers, the Bol'shaya Laba and the Belaya, and their tributaries dissect the northern slope of the Great Caucasus range. The rivers of the southern slope - Mzyma, Sochi, Shakhe - flow into the Black Sea. These rivers form numerous waterfalls with heights from 5 m to 250 m and more. Abadzekhskoe Gorge in the River Tsitsa headwaters makes a vertical descent of 1 km over a 10 km length. (Nomination, 1998, IUCN, 1999). Western Caucasus is a boundary zone between moderate and warm humid climatic belts. The mountain ridges of the Great Caucasus range form the main climatic boundaries between the northern and southern climates, interrupting flows of cold air from north to the south. Temperatures below zero are characteristic in the northern parts in winter, while in June the temperature reaches 20°C. The southern part, formed by the low mountains of the Black Sea coast and has warm and damp climate close to subtropical. The average January temperature is 4.2°C, and 20-21°C in July-August. Air temperatures in mountains of the Great Caucasus fall 0.5°C for every 100 m increase in altitude, and absolute minima can reach -20-22°C. The annual precipitation is about 1,000 mm and increases with height. The highest precipitation is in vicinity of Achishko and Fisht Mountains, where it reaches 3,000 mm a year. Snow cover is 2-4 m thick on flat mountain slops, while in valleys and gorges it may be accumulated up to 10-16 m. (Nomination, 1994). The flora of the area is characterised by clear vertical zonation patterns. Deciduous forests occupy the mountain foothills up to 1,000-1,200 m above sea level. This belt consists of pubescent oak Quercus petaraea, Durmast oak Q. Petaraea, common pear Pyrus communis, European chestnut Castanea sativa, the hornbeam Carpinus caucasica and oriental beech Fagus orientalis forests. Groves of box Buxus colchica and yew Taxus baccata are especially prized. The belt of dark coniferous forests is located between 1,000 and 2,000 m above sea level and consists of forests of fir Abies nordmanniana and various pines Pinus spp. About 70% of the territory covered by the fir forests. Above 2,000 m, these forests give way to birch Betula pendula and B. litwinowii, as well as the maple Acer laetum and A. trautvetteriare. Above the forest line, at almost 2,500-m, vegetation includes a subalpine zone with the endemic Caucasian rhododendron Rhododendron caucasicum and other shrubs of Betula and Salix. This is followed by alpine meadows and rocky outcrops that yield in places to sub-nival and nival belts, at 2,900 m. Terrain above this altitude is permanently snow-covered. A total of 1,580 vascular plant species have been recorded from the site, including 967 species from the high mountain zone, about one third of which are endemic to the Caucasus. There are 160 species of plants, which are in danger of extinction and which are listed in Red Data books of Russian Federation and regions: Republic of Adygea and Krasnodar Territory. There are also over 700 species of fungi, 12 of which are threatened in Russia. (Chebakova, 1997; Nomination form, 1998, IUCN, 1999). The diversity of the landscapes of the Western Caucasus, is also reflected in the fauna of the nominated area, with some 384 recorded vertebrates. Some 60 species of mammal have been recorded in Kavkazkiy Nature Reserve and Sochi National Park. These include wolf Canis lupus, brown bear Ursus arctos, lynx Felis lynx, wild pig Sus scrofa, Caucasian deer Cervus elaphus moral, roe deer Capreolus capreolus, and reintroduced European bison Bison bonasus, tur Capra caucasica and chamois Rupicapra rupicapra. Five species were registered in the Red Data Book: the bats Miniopterus schreibersi and Nyctalus lasioterus, Caucasian otter Lutra lutra meridionalis, the leopard Panther pardus ciscaucasica and a reintroduced population of European bison Bison bonasus. The avifauna of the site features 126 different species of which 17 are registered in the Red Data Book of Russia. Among them: black stork Ciconia nigra, osprey Pandion haliartus, Levant sparrow hawk Accipiter brevipes, short-toed eagle Circaetus gallicus, tawny eagle Aquila garax, imperial eagle A. heliaca, and golden eagle A. chrysaetos. Seventeen reptiles have been registered on the territory, two of which listed in the Red Data Book of Russia: the turtle Testudo graeca and the viper Vipera kaznakowi. About 2500 insect species have been recorded from the area, but it is likely that double this number may occur. Several of these species have been listed in the Red Data Book, in particular Caucasian ground beetle Carabus caucasicus, Alaus parreyssi, Rhesus serricollis, Rosalia alpina, Apollo butterfly Parnassius apollo, and P. Mnemosyne (Chebakova, 1997; Nomination, 1998). The history of the human occupation of this region can be traced back about 500 thousand years, archaeologists have found more than 150 sites of the ancient people in the area. Neanderthal man occupied the region, along with many now extinct species such as mammoths, aurochs, and wild horses. Since the first half of the 6,000 BC the region became a place of several resettlements and migration waves. At the end of 4,000 BC in the area was established a tumulus culture that had connections with the migration wave from Forward Asia. The territory was a part of highly developed Maikop culture that existed up to the 1,000 BC: numerous findings have been found in the tumuli including unique golden adornments, and artefacts made of metal and clay. For many centuries the territory of the territory has been largely uninfluenced by human activities and more recently there has only been a little impact of logging, grazing and hunting around the periphery. (Nomination, 1998). LOCAL HUMAN POPULATION No resident population. Kavkazkiy Nature Reserve has restricted tourism activities in peripheral areas, although for the most part these remain un-quantified. In 1997 2,934 people has passed along the one established tourist route, while the museum at Guzeripl is currently receiving about 3000 visitors per year. The River Belaya within boundaries of the Nature Reserve is a place for annual international competitions of water sports. In 1997 150 people took part in this competition. No information available about visitors facilities (Nomination, 1998). SCIENTIFIC RESEARCH AND FACILITIES No information. One of the most remarkable features of the site is the lack of human influence at the present time or in recent history. The nominated area includes a important variety of natural ecosystems, about 80% of ecosystem types of the Great Caucasus. It represents distinctive ecological belts that change with altitude from subtropics up to glacial and nival zones. It also includes about one-third of all vascular plants recorded from the entire Greater Caucasus, including many of the endemic and relict species for which the area is renowned. The territory is difficult for access and remains one of the largest strictly protected area containing a variety of endemic, rare and endangered species (Nomination, 1998). CONSERVATION MANAGEMENT Kavkazkiy Nature Reserve is managed by the Russian State Committee of Environmental Protection in co-operation with Forestry Committee of Republic of Adygea. A management plan for the site was drawn up in 1997, dividing the reserve into six regions each with a team of rangers. The Russian Ministry of Forestry manages the Sochi National Park, although the Forest Committee of Krasnodar Kray has some influence. A project for the management of this site was drawn up in 1987 with detailed maps and division into four zones, proposals to amend this into a 5-zone plan have yet to be realised. Three natural monuments and the nature park fall under the jurisdiction of the Cabinet of the Republic of Adygea, although there are no management plans for these sites (Nomination, 1998, IUCN, 1999). MANAGEMENT CONSTRAINTS Overall the large and inaccessible nature of the nominated area means that the degree of threat to the park is generally low, however there are four areas of concern. Although illegal there is some hunting of ungulates in the area. There may also be a minor problem of the impacts of hunting outside the park boundaries, and it has been suggested that relative increases in the provision of salt for ungulates in the hunting reserves around the area may have drawn some animals out of the park. Although there are currently no roads in the nominated area there is a proposal to construct a road across the site from north to the Black Sea coast at Dagomys. Such a construction would clearly compromise the wilderness value of the park: there would undoubtedly be impacts from the construction work itself, but it would also open up wide areas that are currently inaccessible. (IUCN, 1999). STAFF There are 199 staff in the Kavkazkiy Nature Reserve, including 15 administrative staff, 45 scientific workers, 95 rangers, 8 people in the department of ecological education and 44 technical personnel. 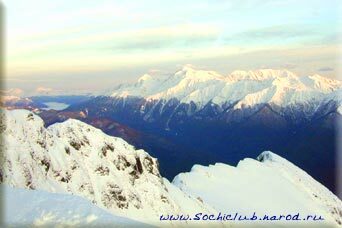 Sochi National Park has 169 staff, including 17 administrative staff and 15 forest guards. The remainder are guards, technicians and other workers. There are no staff assigned to the other protected areas, although the staff of the Kavkazkiy Nature Reserve undertake some management activities.